Antigua and Barbuda is a beautiful country encompassing its 2 namesake islands and several smaller islands. The country is famous for reef-lined beaches, rain forests and resorts. The currency is Eastern Caribbean Dollar. Antigua and Barbuda is a member of the UN, Commonwealth nations, CARICOM and the Organisation of American States (OAS). 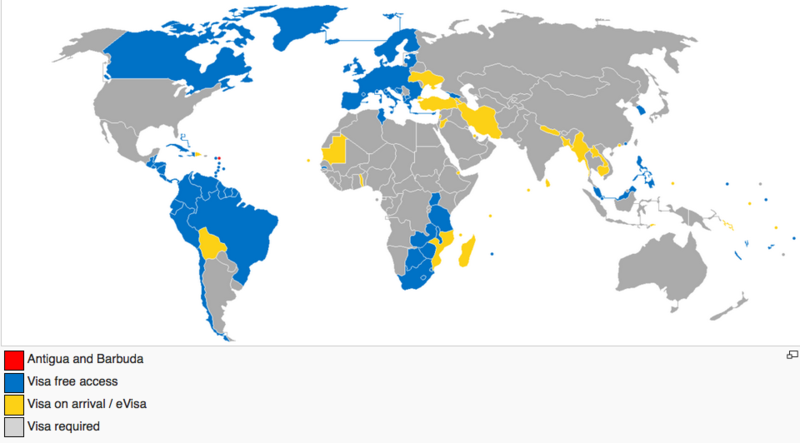 Antigua and Barbuda passport enjoy visa free travel to approximately 130 countries, including the U.K., Canada, and the countries of the Schengen area. Immediate lifetime citizenship. Passport renewed every 5 years by paying a very small fee. Spouse, children can be included under one application. Afghanistan, Iraq, North Korea, Somalia, Yemen, and citizens of Iran cannot apply. Exception: If you are national of these countries but have PR status in UK, USA and Europe, you can apply for this program. has a criminal history record. is, or is likely to be, involved in any activity likely to cause disrepute to the country. has been denied a visa to a country with which Antigua has visa-free travel arrangements (UK, EU Schengen etc..) and has not subsequently obtained a visa to the country that issued the denial. if you are national from a country where the trade embargo has been imposed.